Inventory We are a resale marketplace, not a box office or venue. Ticket prices may exceed face value. This site is not owned by John Paul Jones Arena . 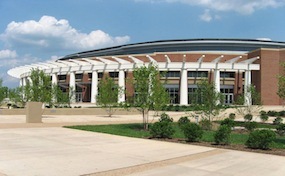 John Paul Jones Arena, or JPJ, opened for the 2006 through 2007 NCAA Division I basketball season and is located at the University of Virginia in Charlottesville, Virginia. It has seating for 14,593 fans, nearly twice the capacity of 8,457 at Virginia's previous facility, University Hall. The design features pergolas on the outside to tie in the design with Scott Stadium, UVA's football facility. This style is known as Jeffersonian architecture, reminiscent of the many buildings designed by Thomas Jefferson on UVa's grounds and nearby. The arena is not named after the American naval hero, or the Led Zeppelin bassist, rather it is named in honor of the father of Paul Tudor Jones, who donated $35 million for the construction of the arena. He earned a B.A. in Economics from the University in 1976. His father, John Paul Jones, is a 1948 graduate of the University of Virginia School of Law. The arena plays host to not only basketball games, but a wide variety of concerts, performances and other events; for example, its opening season in 2006 includes events such as Cirque du Soleil, Larry the Cable Guy, The Wiggles, Disney on Ice & WWE Monday Night Raw. The JPJ.ArenaCharlottesville.com is a privately held company that specializes in the sale of tickets in the secondary market. We are not affiliated with any official supplier or box office. To purchase tickets to any John Paul Jones Arena in Charlottesville events simply call our operators at anytime or click on the event you wish to attend.